Just imagine what Wall St. will be doing with the trillions of CDOs? Way to kick off Friday Keith! "For fast, effective relief" LOL! Yeah, if only. Uh... is that available at Rite-Aid or CVS? There's nothing wrong with this house that a good coat of fire wouldn't fix!!! 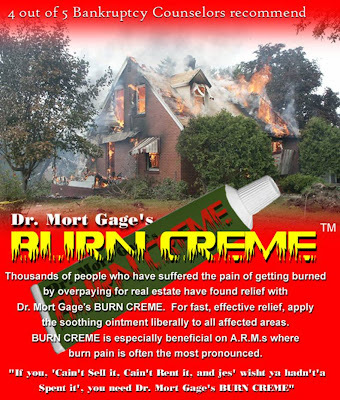 In my mind anyway, Dr. Mort Gage's Burn Creme certainly rivals other greats like "Fantasyland Mortgage" and "Senor' Cardage Mortgage"! Does it come in "institutional size"? "that a good coat of fire wouldn't fix" LOL! Damn! Or as my father was fond of saying, "All that place needs is a match". I guess Paulson is sharing the fairy dust I talked about after all. Man, this is gonna leave a very big mark! Delusional!! Despite turmoil in the housing markets that includes record foreclosure numbers, mortgage rate increases and home price depreciation, homeowners don't believe there's a real estate slump, according to a new poll. Most - 55 percent - are confident that their homes continued to increase in value compared with a year ago, according to a nationwide telephone survey conducted this month by The Boston Consulting Group (BCG), a business and management strategy firm. The overconfidence of homeowners doesn't jibe with the findings of most home-price indices, which point to lower median single-family house prices of about 2 percent nationwide. "Americans [are] positive about their homes' value and believe in a bounce-back in residential real estate overall," said BCG Senior Partner and consumer spending expert Michael Silverstein. 74 percent of the survey respondents said they were confident that they could sell their home within six months at the price they think it's worth. Inventories are increasing in many markets, however - listings now spend an average of more than seven months on the market, up from five or six months last year. Looking long-term makes homeowners even more optimistic: 85 percent believe their home will rise in value during the next five years, and 63 percent believe a house is a good investment. The perception gap between what Americans believe and the current housing market reality can influence their behavior. According to Silverstein, most homeowners (76 percent) have not, for example, pared back their consumer spending in response to current market conditions. Real estate price gains bankrolled much of the consumer spending of the past few years. Homeowners tapped into rising home values through home equity loans and lines of credit and cash-back refinancings. According to economist Dean Baker, of the Center for Economic and Policy Research, in doing so they added mortgage debt in the first quarter of 2007 at an annual rate of $510 billion. The ratio of equity-to-home-value stood at 52.7 percent, a record low. Home price declines, of course, also contributed to the drop in home equity. Not every homeowner is so optimistic - the survey found that 16 percent have cut back spending as a result of lower real estate values. But the majority seem blithely positive. "Consumers don't view blips in overall housing prices as a catastrophe," said Silverstein. Indeed, 69 percent reported that they're confident enough that they are likely to renovate or make some improvement in their home during the next 12 months, and 27 percent said they are likely to be moving on up, if not to the East Side, at least to a better house sometime in the next five years. Many of the survey respondents appeared to feel that bad things happen to other people; 49 percent were concerned that there was a moderately severe impact on the overall U.S. economy from the weakening housing market, and 12 percent said it was not hurting the economy at all. A majority - 52 percent - said the current housing slump would end within two years. There, they seem to agree with housing industry insiders such as Lawrence Yun, economist with the National Association of Realtors and Doug Duncan of the Mortgage Bankers Association. Their organizations also tend to be optimistic about most housing-market matters. Just make sure you take the flat screen and granite counter tops out first before applying the creme. Those items add $50K to any house so you don't want to torch them. Keith would this fall under The Heat activated KY Creme or is this strictly for Jock Itch? Americans [are] positive about their homes' value and believe in a bounce-back in residential real estate overall. Yeah, that's me. I can't wait to start using my house as an atm again. It's been an outrageous insult that I haven't had any free money so far this year. WHERE'S MY FREE MONEY??? IT'S MY BIRTHRIGHT! I live on the panhandle of Floriduh and our local birdcage liner of a newspaper is the Northwest Florida Daily News. Yesterday, the following article was on the front page. It's about local realtwhores having a prayer meeting to implore God to improve the local real estate market. Seriously! As if the Almighty has nothing better to do. Realtors say their prayers: The Emerald Coast continues to struggle with a disappointing real estate market. Real estate sales are down all along the Emerald Coast. According to figures from Metro Market Trends, total sales in Okaloosa County in May were down 44 percent compared to May 2006, and year-to-date sales in 2007 are down 36 percent compared to last year. Losses in the U.S. mortgage market may be the “tip of the iceberg” as borrowers fail to keep up with rising payments on billions worth of adjustable-rate loans in coming months, Bank of America Corp. analysts said. It looks like most of these sheeple have moved to the banks of that river in Egypt--"deNial." And it's just so wrong to warn anyone about a Housing Bubble.When I sold gold before the Peak,and took my profit I guess I was making a huge Mistake?Not. Burn Baby Burn Cream for sheep. Bwahahahaha. You have DE-Railed, lol. Yep, we had a fire in the St. Louie where a condo project got flamed and the chief came out with a statement saying it had been deliberately set. I wonder if they used burn creme? Wow, what bad advice to give, as if insurance fraud is any kind of answer for flagging home values. For one, and perhaps most important, arson for fraud is a felony. It's illegal. If that's not compelling enough for anyone, the reality is the insurance pay-off does not cover the costs of replacement, and the home owner will be held liable for payments. There was a recent thread on this one. On the other hand, maybe people who've committed mortgage fraud to get IN to the house are against the idea of committing insurance fraud to get OUT of it. They're part of the whole "the world revolves around me" thinking that drove the market sky-high in the first place! This is like the guy who's girlfriend dumps him, but decides to kill her, justifying with "if I can't have her, no one else can either". Lovely. Some probably rationalize arson, saying the insurance company can afford it. That's total B.S. This thinking is identical to the "I'm getting mine, so screw the rest of ya'" thinking. Wow, I think I'm starting to side with the guys who think HP is a bunch of nutjobs, molotov-throwing Bolsheviks who are more excited by arson and destruction, rather than seeing the market get back to normal. If that's the case, then good luck with THAT! God said that I have a right to steal my money back. I heard every store in Scottsdale is overstocked with this stuff. They ordered extra inventory due to demand in Scottsdale, but nobody has five bucks left on their credit card limits to buy a package. "Wow, I think I'm starting to side with the guys who think HP is a bunch of nutjobs, molotov-throwing Bolsheviks who are more excited by arson and destruction, rather than seeing the market get back to normal. If that's the case, then good luck with THAT! " It is a joke, there are some people who are going to commit arson in an attempt to get out bad positions whether we make fun of them or not.... get a sense of humor already.... now pass that burn cream already, I've got a condo project that is fresh out of financing and not a soul is taking me up on the discounted pre construction prices I'm offering. Just kidding. "For one, and perhaps most important, arson for fraud is a felony. It's illegal. " Funny you mention that. I saw a study the other day that people are letting their mortgage payments go unpaid, while trying to stay afloat with their credit card. Why? Hey, people need credit cards to buy groceries at the store, dining out, etc. In other words, the credit card has more utility in their lives than the mortgage, especially now that the housing ATM has been tapped dry. That's the HP troll's house. He was so sick at today's news he lit his fart on fire and torched his shack. Does it work on hemoroids! Who the hell is this Benji Franklin dolt. Obviously you haven't been a faithful reader of the blog. Sure...I might not know who Keith is, never talked to him and for all I know he looks like mini-me. But who cares. Keith wants a better society for ALL mankind...not just us greedy western civilization dickwads. I doubt that anybody here either endorses nor condones insurance fraud but if you think that some of the desperate homedebtors aren't going to resort to drastic means you are only kidding yourself. Don't get all pissy just because you arrived late to the bubble party. We are just pointing out what we all knew would happen...and we will keep pointing it out. I'd start buying put options on Insurance companies for late 2008-2009 when the time comes. Exactly, and in Arizona, they rarely check credit on renters, so these desperate homedebtors can get foreclosed and file bankruptcy with no fear of being turned down. When I moved here to CA and rented, they went over my credit with a fine-toothed comb, but when I lived in Scottsdale it was more like "sign the lease, here's your keys." And if you think perpetuating the common misconception that committing arson is some alternative for some FB who's upside-down in a home, you're an idiot who knows not of what you speak. So quit posing as an "ex-insurance adjuster": you don't have a clue. Even putting aside the "innocent bystanders" and firefighters who are killed or injured in arson fires (heard about those (9) firefighters who died last week? ), all arson does is decrease supply of existing inventory, which drives prices HIGHER. The REIC benefits from idiots setting homes on fire. Is that what you want to accomplish? I want the FB OUT of the house, left as clean and intact as possible. I don't want them to screw with what is potentially MY home. I was walking home from the Lawrence Ma trian station and saw a home that was recently for sale .... burned out This will be happening with increasing frequency!!!! Heard of anyone buying a lot of insurance all of a sudden?